Click here to see the instructions for making this Twilight inspired dish. I think you are an absolute genius! I don't know how you come up with this, but it looks amazing. I can only imagine the looks on my family's faces if I served these. That's a pretty amazing project and looks great, but its more work than I would do. I'm sure I would mess it up somewhere along the line! I really love this idea! Very cute, I don't know if I'd do Edward, I'm more Team Jacob, LOL! Love your recipes, food art is the best! I really love this recipe, I'd love to try it sometime! I don't know if I'd use Edward though, I'm more Team Jacob! LOL! I love food art, your recipes are inspiring! WOW! I scrolled down the page looking for the picture, LOL! Once i saw you talking about stencils I realized I'd passed it by thinking it was just a plate!! I think that this looks like an awful lot of work - I hope that whoever makes it has people over who would be thrilled by it!! and black teeth after eating it?! LOL! Guess that will show the moms who brushes and who doesn't! You are out of control!!!!! 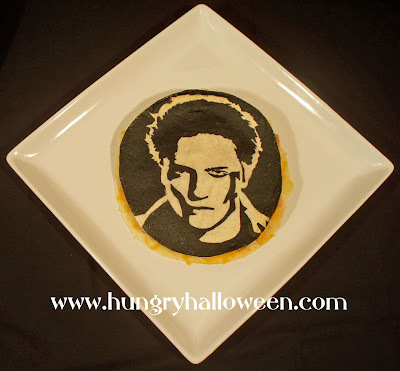 This is such a fabulous idea, what a great idea for a Twilight party and so doable!